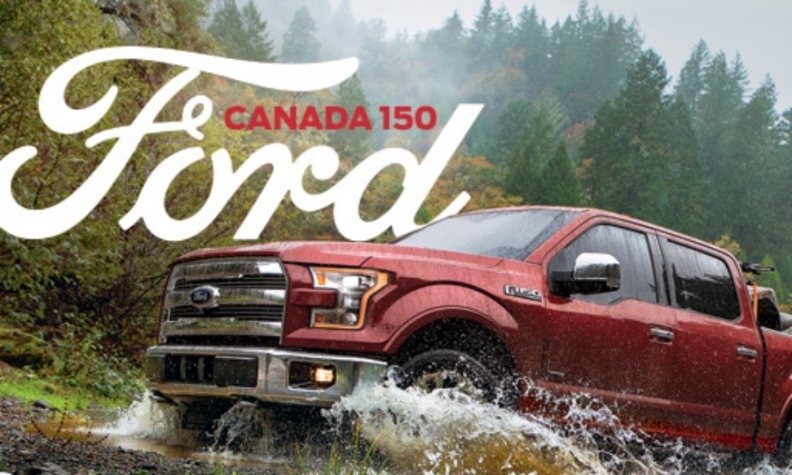 Ford is just one of several automakers using social media as part of Canada 150 celebrations and promotions. Automakers will mark Canada's sesquicentennial celebrations July 1 with variety. Here's a look at how some of them are celebrating Canada's 150th birthday. CHEVROLET has partnered with ParticipAction to award prizes to contestants who sign up for “150 activities that define our land and people,” such as lacrosse, snow shovelling and sledge hockey. Each completed activity gives a chance to win prizes that vary from Tim Hortons gift cards up to travel to the Grey Cup football game, and even a $40,000 Chevy. FORD also has a nationwide drive promotion, but is supplying established bloggers with Ford vehicles to take photos at various Canadian sites of their choosing. They’ll use the hashtag #GoFurther150 on their own posts, and one winner will be chosen to be awarded a four-day vacation in Newfoundland. HONDA gave away a new Civic at the Blue Jays game on Canada Day, as it’s has done in previous years. It also debuted the new Odyssey minivan to media in late May in Charlottetown, the birthplace of Confederation, to include a well-timed patriotic element to reviews of the vehicle. a truly British manner…will provide well wishes to Canadians celebrating on July 1.” There will be two “hero videos” filmed in Canada: the first stars the new Land Rover Discovery and the other, the Jaguar F-Type SVR, which will “showcase a celebratory feat never done before, however we may have overdone it a touch.” Both campaigns went live June 22. MERCEDES-BENZ organized a media trip across Canada, from St. John’s, Nfld., to Victoria, B.C., that visited all 10 provincial capitals in five days of driving and flying. Dubbed the #CabriOCanada150 tour, six invited journalists drove eight different models of Mercedes convertible cars in time for their stories to appear for July 1. In Newfoundland, however, where it was snowing, they only drove around the block before flying to Halifax. PORSCHE is offering the Porsche Tour Canada 150 in September, in which up to 20 participants will drive a new Porsche 911 Carrera 4S on a 10-day, 3,000-kilometre road trip from Toronto and ending in Halifax. “Food will be served in world-class restaurants, and you’ll rest your head in only the finest accommodations,” according to Porsche. “Every leg of the tour is designed to unite the driver and explorer that live in all of us, to experience just how far Canada has come in 150 years.” It costs $11,995 per person, plus tax. SUBARU had a “Looking Good Canada” contest for all fans of its cars, who were asked to take pictures of their Subarus “against the backdrop of our Canadian landscape.” Five finalists were selected, one from each of five regions; a winner was chosen by online voting, who then win a trip to Ottawa in time for Canada Day. to become innovators and leaders. It’s expected to reach more than 100,000 youth with stops in more than 80 communities across Canada.